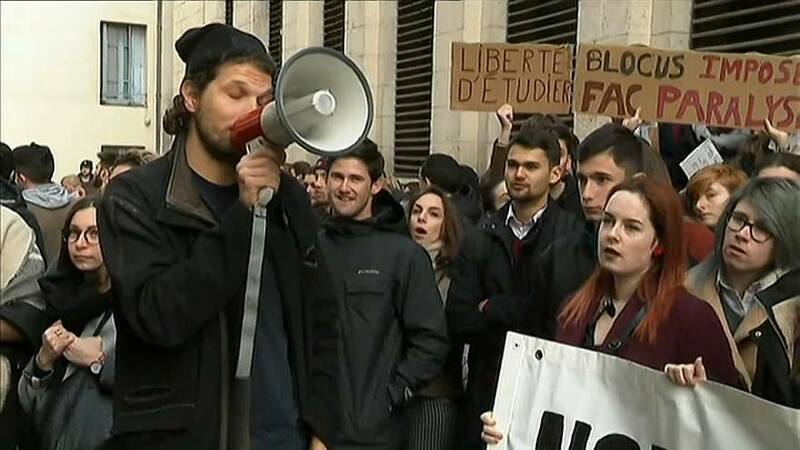 Tension has been rising in universities across France as the government attempts to reform access to university places, reforms which are proving unpopular. Faculties in Paris, Tolouse, Bordeaux and Lille students have mobilised en masse with demonstrations and blockades. The government says it wants to improve career paths and choices at the end of high school, and try to cut numbers in over-subscribed disciplines like law or medicine. Critics of the plan say it is the thin end of a wedge that will see the introduction of selection, the end of freedom of choice and the idea of a university for all. "This is preventing students who are mobilized with us today from going to university, choosing their studies. And choosing your studies today is choosing your life, choosing your future," said one young man supporting the action. With exams on the horizon the protest movement has created tensions with non-demonstrating students. Riot police had to be deployed in Bordeaux to evacuate strikers, but the worst violence has been in Montpellier, where the Dean and one of his teaching staff at the law school are being investigated by police for allegedly taking part in a masked attack on striking students.